Hail, citizens of indie rock video world! It’s Andy Gesner and the staff from HIP Video Promo here to deliver yet another surefire hit from a band that can’t help but produce masterpiece after masterpiece. 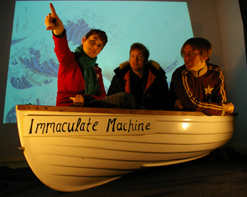 Immaculate Machine was one of the most promising new acts of 2005 – their debut full-length, Ones & Zeroes, hinted at a powerful fusion of classic new wave and contemporary indiepop. The trio seemed to draw inspiration from Belle & Sebastian and Talking Heads evenly, and on infectious songs like “No Way Out” and “Broken Ship”, this left-of-the-dial independent band sounded practically ready for Top 40 radio. Reviews for Ones & Zeroes were ecstatic, commending the band’s pop smarts, musicianship, and youthful enthusiasm. As interest for further recordings mounted, Immaculate Machine became underground celebrities in their hometown of Victoria – a city now recognized everywhere as a breeding-ground for compelling pop acts. The trio toured North America, released an EP of French-language versions of songs fromOnes & Zeroes, and laid the groundwork for their next move. Immaculate Machine’s Fables, the band’s follow-up, exceeds expectations dramatically: not only are its melodies keenly-turned, but Brooke Gallupe, Luke Kozlowski and Kathryn Calder have developed a lyrical perspective that is at once engaging and bittersweet. They’ve always been emotionally direct, but here, they’re singing with a frankness borne of experience. As they proved on Ones & Zeroes, the three members of Immaculate Machine are precocious instrumentalists, too. Kozlowski is a restlessly inventive drummer, Gallupe a precise and passionate guitarist, and Calder has a deft enough left hand that the band doesn’t need a fourth member: she just covers the bottom end with low organ or synth, and you don’t miss the bass player for a minute. And just as is always the case in the best indiepop bands, everybody sings – and Immaculate Machine never sounds better than when they’re all singing together. Kathryn Calder is sometimes described as Neko Case’s understudy in the New Pornographers, and while that’s technically accurate, her role has actually been more pronounced than that: she played and sung on Twin Cinema, and has toured North America with Vancouver’s most heralded act. In her time with NP, Calder has been introduced to indiepop fans around the globe – and she’s picked up a few useful contacts, too. New Pornographers bassist and multi-instrumentalist John Collins co-produced Fables, and he’s added his array of dizzying synthesizers and percussion to Immaculate Machine’s well-crafted mix. Final Fantasy’s Owen Pallett – perhaps best known for the glorious string settings he contributed to Neon Bible by the Arcade Fire – reprises his role as master-arranger here, coloring the aching “Roman Statues” and “Small Talk” with violin and cello. 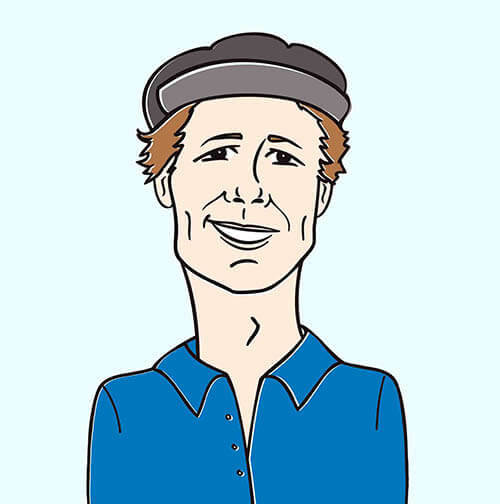 Finally, The Cribs and Alex Kapranos of Franz Ferdinand makes a guest appearance, too, singing the chorus of “Jarhand”, the album’s lead track and first single. Immaculate Machine is a band with energy to burn, and its members don’t like to sit still in their videos; the clip for “Broken Ship” caught Kozlowski, Calder, and Gallupe during an off-the-wall ping-pong tournament. The “Jarhand” video is comparably kinetic – but this time, the members of the trio are filmed on a dead run. They’re engaged in the retrieval of painted panels from hiding-places around Vancouver, and some are more difficult to obtain than others: for instance, while Gallupe lifts one off the side of a building, Calder must use stealth to swipe another from a rollerskate gang! It’s all a bit like a live-action video game, and the members of Immaculate Machine are dressed for exercise. Once they’ve collected the paintings, they assemble them on the wall of a warehouse – and together, they make a backdrop that looks not unlike the cover of Fables. Unwilling to rest (or even catch their breaths! ), the members of the trio plug in and play, while their friends dance ecstatically around them. It is a thrill to be back in the saddle, working with the terrific folks at Mint Records to bring you another winner from Immaculate Machine. You can also catch the band on their Canadian/West Coast U.S. tour starting in late July. If you want to set up interviews, video IDs, see them live, or even get your hands on some copies of Fables for on-air giveaways, let us know and we will do our best to accommodate your request. If you need more info call Andy Gesner at 732-613-1779, or email HIPVidea@aol.com. You can also visit www.MintRecs.com, or www.ImmaculateMachine.com to find out more about Immaculate Machine.